Learn to Program and Troubleshoot PLCs! CIE's Industrial Electronics with PLC Technology course was revised to include lessons on Programmable Logic Controllers, Servo Motors, Servomechanisms, PLC programming and PLC troubleshooting. This distance learning course provides a thorough understanding of industrial electronics and essential troubleshooting techniques necessary to maintain, repair and program a wide array of industrial electronic equipment including robotics, servos and programmable logic controllers. In addition, students graduate with the ability to read and understand many different types of schematics and operational manuals. A programmable logic controller (PLC) is a computer-based device capable of controlling many types of industrial equipment and entire automated systems. The advent of low cost computers has made the PLC the most common choice for manufacturing controls today. They can be programmed to do a variety of functions through a simple ladder logic program. PLCs have a strong presence on the factory floor and will probably remain predominant for some time to come. They are used in just about every industry all across the globe. PLCs are inexpensive, flexible and can operate for years before failure. Enroll on-line in Course 5 - Industrial Electronics with PLC Technology for $10 down and save 25% off standard tuition. 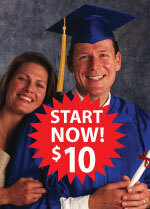 Finance your tuition ($1,482) with low monthly payments of $50. CIE accepts credit card, PayPal, Western Union, money order or check. Call a CIE Admissions Advisor at (800) 243-6446 with any questions or e-mail us. Hurry, special offer ends April 30th! Industrial Electronics with PLC Technology (course 5) contains 78 lessons with instructor support. Our instruction staff works directly with you one-on-one to answer your questions and provide you with technical assistance when needed - even if it's on a Saturday! This program was created specifically for the distance learning student. Experience a step-by-step method of learning that allows you to complete each lesson at your own pace when it's convenient for you! Students graduate with a Diploma in Electronics and are readily employable as electronics technicians. They may continue their education with CIE and receive full academic and tuition credit that can be applied towards CIE's more advanced programs like courses 11 and 14B. CIE has been teaching students via distance learning for 80 years. Technicians and has over 46,000 certified technicians across the globe! Certification enables employers to separate knowledgeable job applicants from those with less training and skills. One of the advantages of enrolling with CIE is that you can study at your own pace. Some students go through the program slowly, others at an accelerated level. We can accommodate almost any arrangement that suits you best and with our generous time allotment of 18 months for Course 5 you can be assured to have enough time to complete your program. Some lesson modules in this course include textbooks that would qualify for our Textbook Buyback Program. CIE’s Textbook Buyback Program enables you to sell your textbooks back to CIE for tuition credit once you are finished with your learning module. They must be in a like-new appearance with no marks, tears or folds. Lesson titles for the Industrial Electronics with PLC Technology.